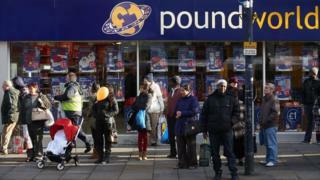 Poundworld has axed 98 jobs from its head office as administrators struggle to find a buyer for the discount retailer. The job cuts at the office in Normanton, West Yorkshire, come after the business collapsed last week, putting a total of 5,100 jobs at risk. The chain, owned by private equity firm TPG Capital, started with a market stall in Wakefield set up in 1974. Its administrator Deloitte has now been forced to make 98 staff redundant. The budget chain's 335 stores are still open and continue to receive stock. Deloitte asked for bids for Poundworld to be submitted by last Friday, but it is thought a buyer for the whole business may not materialise. It said the firm was hit by falling footfall, rising costs and weak consumer confidence, when it announced the administration. What's eating the pound shops? Several retailers have collapsed into administration this year, with both Maplin and Toys R Us disappearing from the UK. House of Fraser has also detailed plans to shut 31 stores, affecting around 6,000 jobs. New Look, Mothercare, Carpetright and a string of restaurant brands have also been shutting stores in a bid to stay afloat.